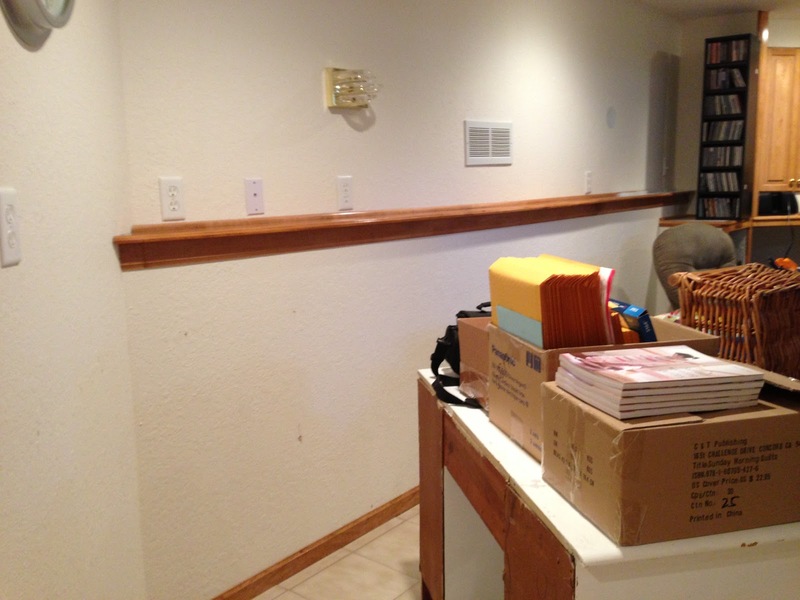 I also finished painting the trim in my basement this week. (a big fat hurray for that!!!) 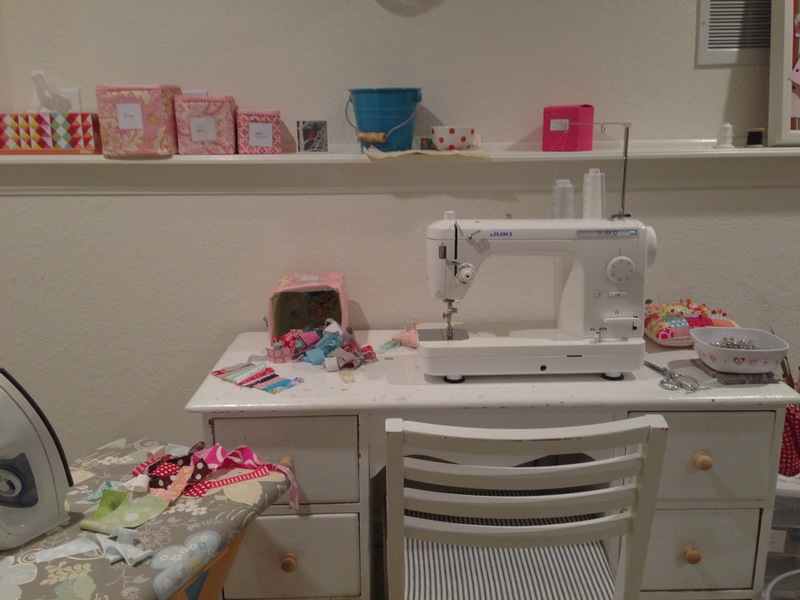 I started putting my sewing space back together. I even got to sew there for a bit before I left. And it was good. love the rug, it looks so happy and scrappy! Have a wonderful time at the retreat! Amanda, 'twas a great joy to meet you face to face last night at the trunk show at Mama Said Sew in Fort Collins (which was also a GREAT discovery)! Y'all are gonna have such an amazing time at the Scrap Management Workshop. Thank you for gracing Colorado with your delightful presence. Your relaxed, easy-going nature, genuine heart for relationship, and authentic joy in listening and sharing life prove the preciousness of your online presence. You are the real deal, and I consider it a great gift, honor and blessing to have met you! You make an impact for good, Amanda! Thank you for doing your part to bring people together and bring out the creativity God has put in each person as we become all we were made to be and do all we were made to do in adding value to this world! Congrats on your excellent book, and may all you put your hand to prosper in every good thing! Love your rug! I don't have a project to share today,, but for sure will check out others.. Thank you and have a great weekend..
Those rag rugs are quite lovely! I just finished re-reading your scrap organization chapter in Sunday Morning Quilts and I ended up using a shoe holder on the back of the door to hold everything. It worked perfectly. What a great idea, thanks! happy retreat! love the white trim, too! Congrats on finishing up the painting! The white trim really updates the room. It looks so clean and modern. I love the rag rug! I'm currently working on gathering enough scraps to make one, too. It's a great project! Thank you for being you, Amanda! I hope you have a great weekend! I loved your rug! I intend to do one with my scraps. I'm never disappointed when I paint something WHITE! What a nice quilting space you have! Thanks for the tutorial on the rug! I always wonder what to do with the final little pieces. First - love the book but would love to win the V&Co copy for my sis. I think she would love it too. Second - we are supposed to say (I think) we love your calves. saying hello from the V & Co competition, love the rug and your other projects! You make so much awesome-ness :) Great linky, as usual! V&CO me mandou dizer que te amo...Então TE AMO Amanda!Eu quero ganhar seu livro,adoro de verdade seus trabalhos e blog.Bençãos. I love your scrappy ideas! Thanks for sharing the finishes. I love the white trim. So spiffy and fresh! Vanessa said to say hello to you. Your book looks great! I'm wishing I could have any chance of being your friend "Tara." Bummer! But I was sent here from Vanessa. So perhaps we can become fast friends soon enough. Cheers! Hello from V & Co... I love the rug! Coming here from V & Co. I'm so glad to have found your blog again. I have your book on my wish list (it looks wonderful! ), and I'm going to give your rag rug a try, but in crochet instead of knitting. Also coming from V& Co-- Your book looks fantastic and I've been looking for a scrap system that works for me. Colors is how my grandma did it but your system looks intense and amazing-- just my style! Hi From Vanessa at V&Company. I adore that rag rug, gonna try that one. I'm here from V & Co to say HI to you! I like your blog!!! Visiting from V & Co, but I read your blog regularly anyway. I really like that rug. Thanks for sharing. I might just have to give it a go. Hello! Here from V & co. Great rug! I love the white too. I had two aunts who made the most gorgeous rag rugs. Yours looks terrific. visiting from V&Co even though I follow your blog! Love the white trim, beautiful! Hello! I came over from V & Co! I love the rug you made. I have been making some with clothesline but I like the look of yours too. Sent over by Vanessa but I was just here 15 minutes ago. I'm loving your white trim too. Mmm, white trim indeed!! I'd looooove a little shelf like that in my sewing room! PS - hello from Vanessa's blog! Vanessa sent me to tell you how much I love your awesomeness! You're fabulous Amanda Jean! Love the idea of using your scraps to make a rug...I think I will need to try this! Visiting from V & Co, love your awesomeness! I think the white trim is an upgraded, too! Love the rug! Hi Amanda Jean! Saw a preview of your book over at V and Co. and it looks great! Hi Amanda Jean! I love your rug (and your book which I've had since the week it came out!) - I don't know how to knit - thinking I could do it with crochet, what do you think? I was sent here from V&Co (happy birthday to Vanessa! ), but I follow you anyway! Love the bright colors of the projects on your blog. I have plenty of scraps to make the rug. Thanks for sharing. I love the white trim also! I just finished painting all the cupboards and trim in my small bathroom white and it looks so clean :-)! Hello from v and c. I have made a scrap rug with batiks for my daughters they love it. I like yours too. Stopping by from v and co...the white trim does make a huge difference! A big hello from another of V's subscribers. The rug is adorable, so, so cute! I headed over here from V&Co. I do love the rug, and am inspired by your awesomeness. I just pinned a rag rug, I'd love to make one! Hello from V and CO.
waving hello from eastern north carolina. love your awesome book! What a wonderful rug!! I have ignored painting our trim for far too long - need to add that to the To-Do List. Jumping over to see you from V & Co --Hoping your day was wonderful! Keep up all the inspiring that you do! The white trim looks fantastic - good choice! Love the rug! Visiting from V&Co, although I read your blog regularly already! coming from V & co, and so glad i did. i think im going to be stuck here for a while. love your blog. That rug is awesome (Oh and Vanessa sent me to say YOU are just as awesome too)! I've always wanted to make a rag run using the crochet technique. I'll take a peek at yours though too. Either way I'm going to have to relearn that skill since I haven't done either since I was a young child. Stopping by to say Hello. Found you on V & Co. blog. What a happy find. Love your colorful style! Hi Amanda Jean, popping in to say that I love your awesomeness (I'm a long time follower & yes, you really are - awesome I mean!). Dropped by from V and Co. Terrific rug! I like the white railing much better. I follow your blog, and v & co too. Both your blogs are awesome! Hi, Love that rug, I really need a rug, or dozen like that one, so cheery it is. Saw it on V and Co. Really need to win your book. Coming here from V and Co but I regularly read your blog and enjoy it! I already follow your wonderful blog, but I am coming over from V &Co website to tell you that you are awesome! Very cool rug. And I'm not saying that you are awesome because V told me to, I've said that all along. Vanessa sent me over to check out your blog ~ I really like it and tell you how awesome you are (you really are!). I'm visiting from V&Co and I wanted to let you know I think your rag rug is great! Hallo! Just wanted to say how great your ideas are. I´ve started knitting the rugmat and friends knitted a hammock! ok..I got so caught up on reading your blog, I had to come back in and leave a message...I LOVE LOVE the knit from scraps rug! I need to make a new one for my kitchen below my sink in varying room colours and for the bathrooms in the colours of. I am tired of buying them and just not being right! This I love, when I first saw it on V and C, I thought V made it! but here I came to leave you a message of how awesome you are (from V and C said: leave her a hello comment and that you love her awesomeness) and got caught up in just how awesome you really are! Love your inspiration! I can see this as the upgraded version of my grandma's rage 'braided' rugs and mats! Thank you! I have got to make that rug!!!! love it. oh, and you rock! So happy to have found you! Came from V & Co! What a sweet rug! I really must try it! And I too love white trim around my floors & walls. I'm in the process of doing the same...back breaking work but so worth it! Love your blog! I am here from V & co., but come here often. You are high up on my bookmarks! You are awesome. Loving the rag rug. So cheerful and happy and a great way to use up scraps! Oh wow, love the paint job. Excited to be following your blog now that V and Co. introduced it to me! I'm here from V & Co., and I do love your awesomeness. :-) Cute rag rug. I'm here from V & Co and lookin' around. Looks great! Signed up to follow your blog! I've been waiting for your book from the Library! I'm sure it will be worth paying for though!! Coming from V & Co. You're awesome! Great rag rug. Beautiful rug! I too, am just starting to repaint all of our trim white!! Love the white trim! Amazing work. Leaving some blog love. I've been a reader for awhile now and have made several things inspired by your work. Love that you use all your fabric- scraps and all and still make creative, colorful projects. Your rug and your space look great. 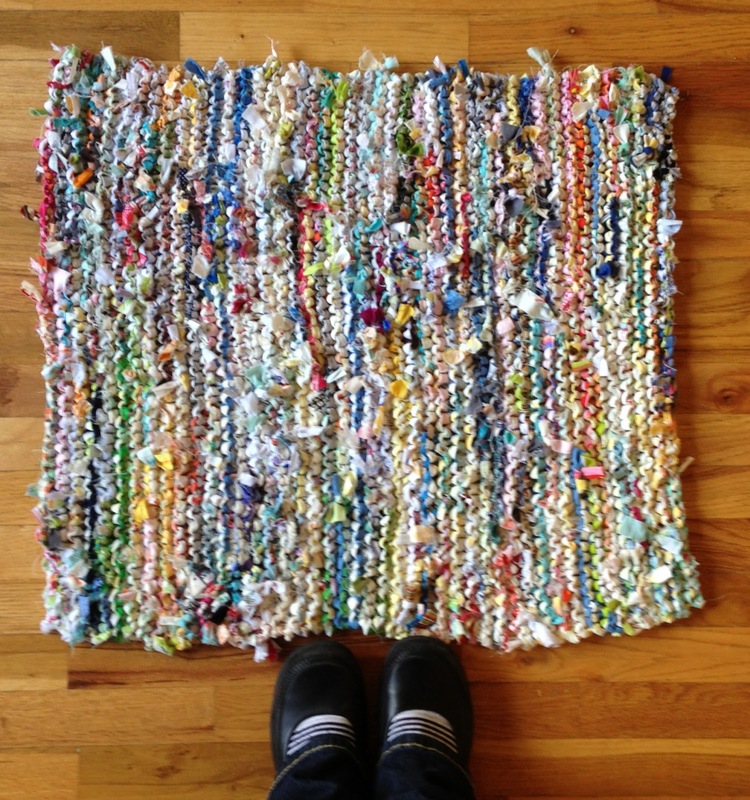 My daughter just mentioned that she wants to make a rag rug -- thanks for the link to the tutorial! Yikes! Now I want to sew so I can make some scraps, so I can knit rugs and make some of those storage bins from your book! I am a knitter, and in my mind's eye, I can see several of those baskets lined up on an old bookcase I have, with all kinds of sock yarn scraps filling the baskets. There just isn't enough time to do all this stuff.